Electron micrograph of corn stunt spiroplasma (CSS, Spiroplasma kunkelii, Class Mollicutes) in sieve elements and other phloem cells of infected maize leaves. CIL:12586, from the same image group, is an unlabeled version of this image. CSS is a wall-less procaryote that causes corn stunt disease and is biologically transmitted by some leafhopper species, e.g. Dalbulus maidis and D. gelbus (Hemiptera, Cicadellidae). Spiroplasma cells are limited by a unit membrane with no cell wall. They can be quasi-spherical, pleiomorphic or maintain a filamentous/spiral form. CSS multiplies in both plant and insect hosts and is transmitted with salivary secretions during feeding of the vector on new host plants. Additional images from this contributor are available in the Library. 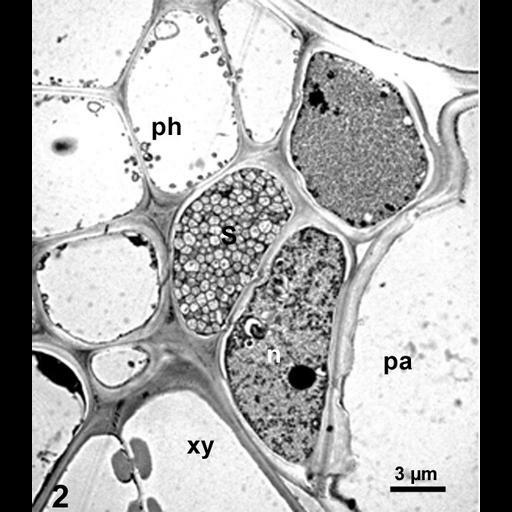 Detailed methods: Tissue was processed for TEM by fixation in glutaraldehyde and osmium tetroxide, embedded in Spurr's medium. Thin sections were stained with uranyl acetate and lead citrate, and examined by a Philips-201 TEM (non-digital camera). Negatives were scanned later to generate these electronic files. Abbreviations: n = nucleus, pa = parenchyma, ph = phloem, S = CSS, xy = xylem.